Legend has it that Coca-Cola helped shape the big-bellied, red-suited personification of Santa Claus. Coupled with its yearly Christmas ads, it’s inadvertent that one might associate the brand with the festive season. This year, Coca-Cola Britain plans to usher in the attention of younger fans by thrusting its fairly new ‘Zero Sugar’ cola front and center in its long-running ‘Holidays are Coming’ campaign for the first time. The glitzy Coca-Cola truck makes its appearance, as it does every year, but this time, Santa is seen holding a bottle of ‘Zero Sugar’ instead of the classic red-and-white glassware. 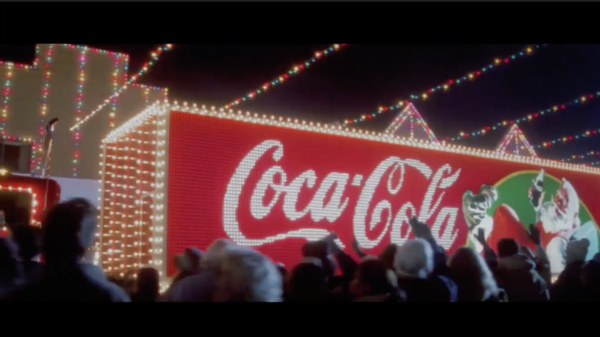 “[This year] marks a significant shift for Coca-Cola as zero sugar will be the Christmas campaign hero—connecting with consumers who have made zero sugar their drink of choice,” said Alec Mellor, Marketing Manager at Coca-Cola Great Britain. Elsewhere, the brand hopes to connect with youths via a collaborative filter with Snapchat, as well as a partnership with LADBible that explores its archives to spotlight how the ‘Holidays are Coming’ adverts have taken root in UK culture. Last but surely not least, Coca-Cola has released the limited edition ‘Zero Sugar Cinnamon’ variation, its first festive flavor in the UK.